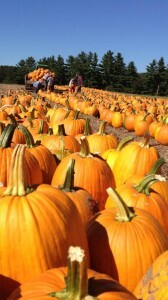 October at Parlee Farms: Pumpkin and Apple Picking and Other Treats! It’s hard to believe it but it’s already October- the last month of our season! The last of our crops available for pick your own are our pumpkins. We grow over 40,000 of them annually over 12 acres of land. Our pumpkins come in all different shapes and sizes, from mini-pumpkins to pumpkins that top the scales at over 40 pounds! If you are looking for the perfect pumpkin to make a jack-o-lantern for Halloween or simply to use as a decoration as is there are plenty of options to choose from. We have a terrific pumpkin crop this year and pumpkin picking is the perfect way to spend a fall day enjoying the crisp air and warm sunshine. October is prime pumpkin picking time, but we are still open for apple picking too! After you’ve found the perfect pumpkins you can head on over to our apple picking orchard to pick some mid and late season apples and spend some time in the “hay play” area where children and families can weave through a maze of hay bales. Another popular destination at Parlee Farms during the month of October is our Farmstand, a post-and-beam barn where visitors can watch homemade apple cider donuts being made. These donuts were voted “Best Cider Donut in New England” by the viewers of New England Cable News! In addition, warm homemade apple crisp, hot cider, and other delicious fall treats can be found at Mary’s Country Kitchen.